rec. Warner Concert Hall, Oberlin College Conservatory of Music, 20-21 August 2013. Antonio Bertali was born in Verona, but spent the majority of his professional life in the service of the Habsburg court in Vienna, rising to the rank of Supremus Musices Praefectus and Kapellmeister. Clearly, he was a musician and composer of significant status in the early Baroque, but his light burns dimly these days. 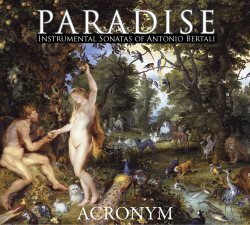 His music is not totally forgotten – Arkiv Music lists over 30 recordings which include at least one of his works – but it is fair to say that of the plethora of Italian Baroque composers, his name ranks well down the recognition scale. I first encountered his music, and indeed, first gained an appreciation for early Baroque chamber music, on the outstanding Naxos release Das Partiturbuch (8.557679 – see reviews). Six of the sonatas presented here are first recordings, which makes this immediately valuable. There isn’t a great variation in mood and tempo between the works, but the order seems to have been chosen to provide as much variety as possible. If you like this style of music, these are stylish and interesting examples of the genre. The eleven-strong ACRONYM ensemble – the letters do actually spell out something meaningful in relation to the group – is strings and organ only, and was formed in 2012 by a group of mostly young musicians, a number of whom attended Oberlin College in Ohio, where this was recorded. They play according to historically informed practice and without vibrato. Their first recording, also on the Olde Focus label, was of the very obscure Polish composer Johann Pezel (1639-1694) and his “Alphabet” sonatas. I bought that at the same time as the Bertali, but found it fairly uninspiring, and have chosen not to review it here. The only comparison with other recordings I have is the Sonata à 4 in d, which opens this recording and is also on the Naxos release mentioned above. In a work of around 10 minutes, ACRONYM takes more than 30 seconds longer than Echo du Danube on Naxos, and the slower tempo is unfortunately not beneficial. I feel that all the pieces would benefit with more drama and impetus. There are also some unfortunate lapses in intonation, emphasised by the lack of vibrato, and I found myself wincing on occasions. The booklet notes are minimal; there is almost as much space dedicated to thanking Oberlin College for the donation of the facilities as there is on the composer. Mind you, I’m not sure how much extant information there is on Bertali.